BBC Sport Northern Ireland will provide bike fans with comprehensive coverage of this week's North West 200 across TV, radio and Online. 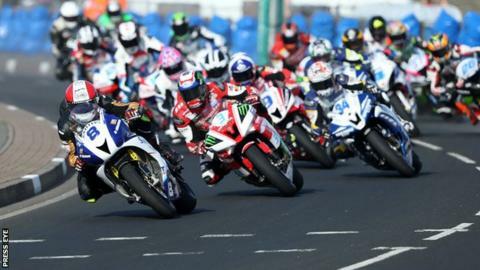 2015 will be BBC NI's eighth consecutive year as the North West 200's primary broadcaster. All practice sessions and races will be streamed live worldwide on the BBC Sport Northern Ireland website. BBC One NI will have three highlights programmes while there will be live Radio Ulster coverage during the week. The TV highlights programmes will take place on Friday 15 May, Sunday 17 May and Monday 18 May, all presented by Stephen Watson and Phillip McCallen. BBC Newsline will also have reports and special behind-the-scenes features throughout race week which takes place from 12-16 May. Radio Ulster will have live coverage of the practice sessions on Tuesday and Thursday in addition to the race action on Thursday evening and Saturday with Joel Taggart and Michael McNamee hosting the programmes. The television coverage will be provided by Greenlight TV, and will feature up to 28 camera angles provided by trackside cameras, the aerial helicopter camera and on-board cameras. A new feature in this year's BBC Sport NI coverage is seeking stories about fans journeys to the annual road racing festival. This new initiative calls for all biking fans travelling to the festival, from anywhere in the world, to share where they travelled from, how they got there and any other interesting stories along the way. BBC Sport NI is particularly keen to hear from anyone who is already planning a trip to the North West 200 from a far flung destination or via an unusual route and who is willing to film short snippets of themselves biking on home roads and their trip to the event. To get involved use the hashtag #NW200journeys when adding any of your NW200 journey content to social media. Email your content, including small photos and smaller video files to nw200@bbc.co.uk - but if sending larger files, contact nw200@bbc.co.uk for instructions on how to access to BBC Sport NI's video transfer portal. You can see the full guidelines on how the BBC might use your content here. Jane Tohill, Executive Producer BBC Sport NI said that the corporation is looking forward to "providing race fans with the best possible coverage of this year's North West 200". The North West 200's technical director Mervyn Whyte said that his team has built up a "strong relationship" with BBC Sport NI. "The BBC ensures that not only the spectacle of the race but also the numerous attractions of the beautiful North Coast will be beamed into millions of homes around the world in an exciting mix of radio, TV and online coverage," added Mr Whyte.